KIEV (AFP) - Ukrainian President Petro Poroshenko warned on Tuesday (Nov 27) of the threat of "full-scale war" and said Russia had sharply increased its military presence on their shared border as tensions escalate between the former Soviet neighbours. "I don't want anyone to think this is fun and games. Ukraine is under threat of full-scale war with Russia," the President said in an interview with national television. The number of Russian units deployed along the Ukraine-Russian border has "grown dramatically" while the number of Russian tanks has tripled, Mr Poroshenko said, citing intelligence reports but giving no precise timescale for the build-up. 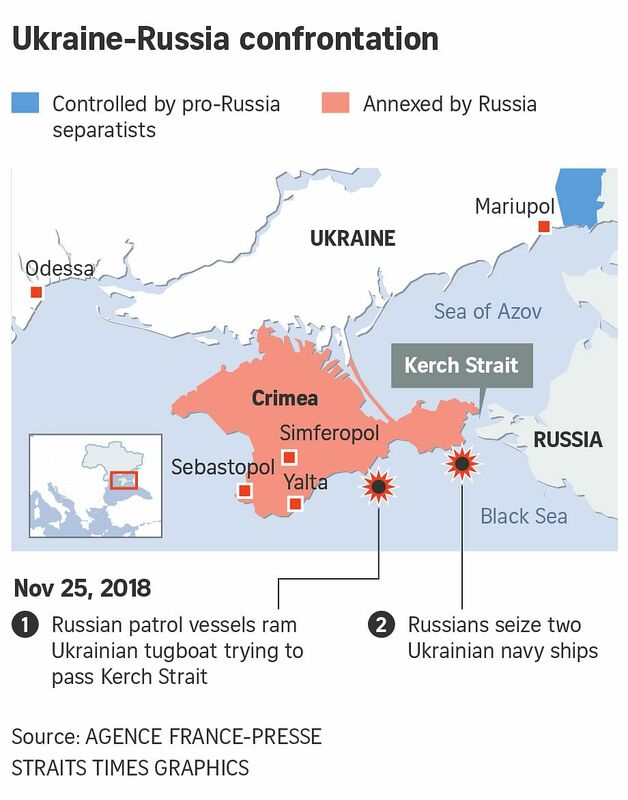 He spoke after Russian forces seized three of Kiev's ships off the coast of Crimea on Sunday and captured 24 Ukrainian sailors, sparking a new diplomatic crisis. On Tuesday, a court in Simferopol, the main city in Russian-annexed Crimea, ordered 12 of the sailors to be held in pre-trial detention for two months. Three hospitalised sailors were also formally detained for two months. The rest are to appear in court on Wednesday. The move is likely to further stoke tensions between Moscow and Kiev, as Russia continues to accuse the sailors of crossing illegally into Russian waters and of ignoring warnings from its border guards. Kiev has demanded the release of the sailors and urged Western allies to impose further sanctions on Moscow. It has raised fears of a wider escalation - in a conflict that has killed more than 10,000 people since 2014 - and prompted international calls for restraint. Russian President Vladimir Putin on Tuesday warned Ukraine against any "reckless acts" after Kiev declared martial law in response to Moscow's seizure of the navy vessels. The Ukrainian Parliament late on Monday voted in favour of Mr Poroshenko's request for the introduction of martial law in border areas for 30 days. This gives Ukrainian authorities the power to mobilise citizens with military experience, regulate the media and restrict public rallies in affected areas. In a phone conversation with German Chancellor Angela Merkel on Tuesday, Mr Putin expressed "serious concern" over its introduction. He said he hoped Berlin could intervene with Ukrainian authorities "to dissuade them from further reckless acts". Moscow has accused Kiev of planning Sunday's confrontation as a provocation aimed at drumming up support for Mr Poroshenko ahead of elections next year and convincing Western governments to impose further sanctions on Russia. Mr Putin said Kiev's actions were "clearly taken in view of the election campaign in Ukraine". Sunday's incident has been playing out on Russian and Ukrainian television screens, with dramatic footage of Russian ships chasing down a Ukrainian tugboat that was trying to pass through the Kerch Strait from the Black Sea into the Sea of Azov. Russian state television late on Monday aired footage of some of the captured sailors being questioned by Moscow's security services. One of them is heard saying "the actions of the Ukrainian armed vessels in the Kerch Strait had a provocatory character" - parroting the version of events put forward by Russian authorities. Ukraine's naval commander Igor Voronchenko said the sailors were pressured into giving false evidence. "I know these sailors, they were always professional. What they are saying now is not true," he told Ukrainian media. Western governments have rallied behind Kiev in the dispute, accusing Russia of illegally blocking access to the Sea of Azov and of taking military action without justification. The European Union, Britain, Canada, France, Germany and others expressed support for Kiev on Monday, in statements pro-Kremlin newspaper Izvestia denounced as "predictably anti-Russian". The foreign minister of Austria, which holds the rotating EU presidency, said on Tuesday that the bloc will next month consider further sanctions against Moscow over the flare-up. "Everything depends on the accounts of events and the actions of both sides. But it will need to be reviewed," Ms Karin Kneissl told reporters. UN chief Antonio Guterres on Tuesday called for "maximum restraint", urging both sides "to take steps without delay to contain this incident and reduce tensions".